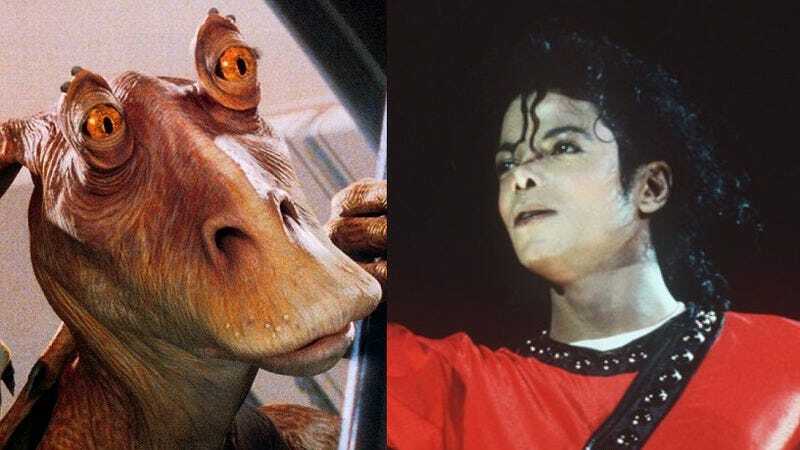 In what could have been the only thing more distracting than a heavily accented space lizard doing pratfalls in the background of the most heavily anticipated sequel in science fiction movie history, Michael Jackson apparently lobbied to play the character of Jar Jar Binks in Star Wars: The Phantom Menace. That revelation comes courtesy of actor and producer Ahmed Best, the man who beat out the alien-loving megastar for the coveted role. Best actually mentioned his casting triumph in a Reddit AMA last year, but he elaborated on the story in a recent interview with Vice, where he discussed his new project 2 Black Dudes, and the various pressures of having his name attached to a character often seen as emblematic of the failings of the Star Wars prequels. Best and Godfrey then led the conversation into a discussion of the ways Jar Jar was a pioneering character in the history of CGI-generated performances, like those often associated with Andy Serkis, and away from mental images of a prosthetic-covered Jackson stumbling around a desert, asking if yousa people gonna die. That might also explain his stated disinterest in appearing in J.J. Abrams’ upcoming The Force Awakens. While Best has reprised his role as Jar Jar as recently as last year, on the animated Star Wars: The Clone Wars series, the fact that Abrams recently joked about showing the character’s sun-bleached skeleton as a treat for fans doesn’t seem to have the actor raring to throw his hat back into the ring, or try to beat out any platinum-selling pop stars for the part.